Given 2E Masters was transpiring after 1E Tin Draft Masters AND Tribbles Masters I knew it was going to be a late night. Assuming I’d be operating on minimal brain power by the time this gig started, I built more to the event’s time slot than the underlying competition. Since I know TOS speed like the back of my hand and the Chula pile can play itself at times, it was the most logical choice for me. I didn’t consider anything else once the scheduling change was announced and it became clear I would likely be called on to participate. This build generally crushes decks running kill piles because so many of the people cost 1 or less and many of them are unique so they can get reanimated later on thanks to Starbase 718, Investigate Cryosatellite. A standard attrition dilemma pile usually isn’t too tough to play against either, because Adopted Authority and An Issue of Trust don’t hurt much and I can typically start double attempting by turn 4 or 5. The only thing that really messes with me shortening the game clock are decks heavy on In Development, Moral Choice, Intimidation, etc. I still saw plenty of those dilemmas throughout the day, but I generally tend to run folks out of bullets eventually. I know you're not big on situational cards, but were there any cards whose usefulness exceeded your expectations? Were there any that you wouldn't include if you played the deck again? Lately, I have become a huge believer in Vault of Tomorrow and how well it works with both a Chula pile and as a general utility card. I love that it can function as a true bailout in a bad dilemma draw situation, like when I used it to get grab Infinite Diversity to cold stop Johnny’s medical-less Dominion horde last weekend. Everything else, from Security Drills on down, serves a purpose and has earned a spot in the Disposable Heroes design for next time. This time around, it would have to be U.S.S. Enterprise-B, Ill-Prepared Successor. I kind of figured most of my games would go to time in light of the stakes, and I think every mission I solved over the course of the tournament I managed to get the 10 bonus points for stopping the ship. Doing so was critical in back-to-back games against Dominion point drain shenanigans. Not really, although I would like to take a second to throw a shout out to Dan and Johnny for being amazing hosts last weekend. Dan did an excellent job running all three events with awesome prize support, and Johnny was extremely gracious in opening up his home for a fun filled day of STCCG. Both guys impressed the heck out of me, and I can’t thank them enough. Lastly, I hope I will see some of you reading this in a few weeks in South Dakota as The Road to Worlds heads to the Badlands for Masters. Sparing that, maybe we can cross paths at North American Continentals in Hot-lanta this June. It’s an exciting time to be playing ‘trek, folks. Get out there and enjoy the games! Oh, you mean this one that I am playing in the Online League right now? I should have known Lucas of all people would remember. I've not forgotten how Mike Harrington beat top players in just 15 minutes with it at worlds in 2014. As far as I'm concerned, this is THE metric for speed decks now. Sisko for midrange verbs (looking at you, Enemy of my Enemy), the Cryosatellite for kill piles (look at you Haz Mat Starfleet), Kirk for wall piles (looking at you Bread & Circuses), and high speed for everything else. Cheers to you ratting me out! I think Kris is absolutely right to emphasize the utility of this speed deck. It isn't just that this deck plays incredibly fast, it also has the ability to gain any skill with Driven (and then multiply that skill with Security Drills. If it's facing some multi-Headquarters jank, just activate the upgrade on Josephs and mill their deck. Nils Baris is an answer to the ubiquitous Chula: The Game or the niche Overwhelmed. While Sisko's keeping the interrupts under control, Matt Decker takes care of the events. Those examples are all in addition to the ones Kris mentioned. But yes, this deck has incredible speed too. Now, to an inexperienced player, speed means cheap cards, but there's another big factor to keep in mind. Decks with a lot of cheap cards empty their hands faster, and thus need to put more resources into drawing cards. Speed decks that have some sort of draw engine (like Common Cause in DS9 Rainbow decks) move even faster, because they can spend more of their counters on personnel instead of refilling their hand. In this case, the bulk of those free draws comes from the text on the Headquarters, but Rigel X also pitches in. It may seem like a lot to give the opponent an extra counter and dilemma draw to get two draws of your own, but when your personnel are expendable anyways, and those two draws could represent two more personnel to throw at missions, it starts to sound like a steal. What achievement made you choose the deck that you used? What other achievements did you consider chasing? I chose it for the new all-KCA achievement. I considered doing another triple-HQ play/win hit. I chose it after playing Amber's version recently and finding it fun, so I decided to make my own; taking some parts from AVB and MVB's versions of the deck and adding my own twist. I was okay facing almost anything. The things that were potential issues would be heavy interrupt prevention/countering (like Holding Cell/Reprimand/etc); or a mass-kill pile. I had played AVB's version a few weeks ago, and this deck also takes from a lot of Cardassian tricks and I've played them at several high-level events. I learned that Cardassians still never should have gotten The Enemy of My Enemy, and the errata did little to curb the power level. All the cheater interrupts are situational to the dilemma pile you face. The Central Command has always shined against stops, and Standard Punishment definitely got me over the top on attributes a few times for solves. The Enemy of My Enemy led directly to a couple wins by cheating in both skills and attributes. It exceeded my expectations in that I though maybe the errata would have reduced the power more, but the games didn't show that. Casualties of the Occupation allowed me to microteam amazingly well in a couple games for guaranteeing no-dilemma last attempts. 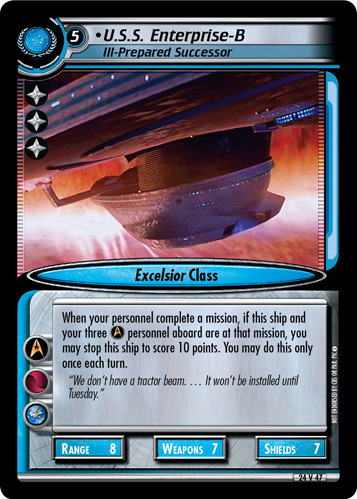 It's situational due to how few Bajorans are in the deck, but used at the right time it was amazing. Playing the deck again, they would all stay in. The Enemy of My Enemy, still incredibly powerful. It was fun to play! I did a little digging, and this is the oldest MVB deck I could find that fits the themes of this deck. There are versions that drop Bajor or use Ferenginar instead; only the most recent ones use Terok Nor like this one. The theme remains the same though; most of the personnel can bust through dilemmas using The Central Command, they can discard Alternate Universe Icon cards that they have no intention of playing with Mardel and Garak, then burn those cards with Casualties of the Occupation for attributes. This decks has some fun tech choices, so let's focus on those. 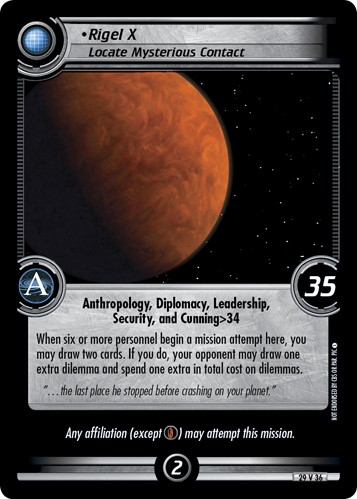 First off, we've got a few copies of Emergency Transport Unit - all those powerful cards I mentioned in the last paragraph don't do a whole lot to deal with kills, and that's where the ETU comes in. 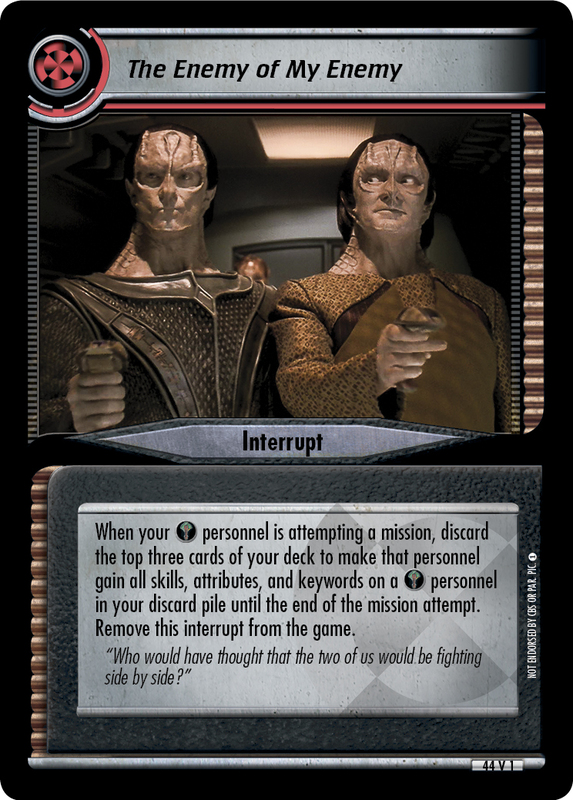 Protecting your investment in personnel like Garak is important in a deck where he's a superstar. I admit that I suspect that Annorax is just getting discarded in the majority of Ken's games, he does have that nice 5-cost and AU icon for Garak and Mardel. However, one disadvantage of a Cardassian-centric KCA deck compared to a Klingon-centric one is that you're stuck using Galors instead of the Alliance Vor'cha. Annorax steps in here to boost those weapons to an Outclassed-proof level. Likewise, that pair of two span space missions (Acquire Illicit Explosives and Deliver Evidence) make up for the mere 8-range (the Alliance Vor'cha is automatically a 9, almost always 10+). Notably, I haven't even touched on The Enemy of My Enemy. Ken calls that card out as the MVP of the deck, and, while he isn't wrong, I'd just like to point out that it has some really powerful company in this deck. 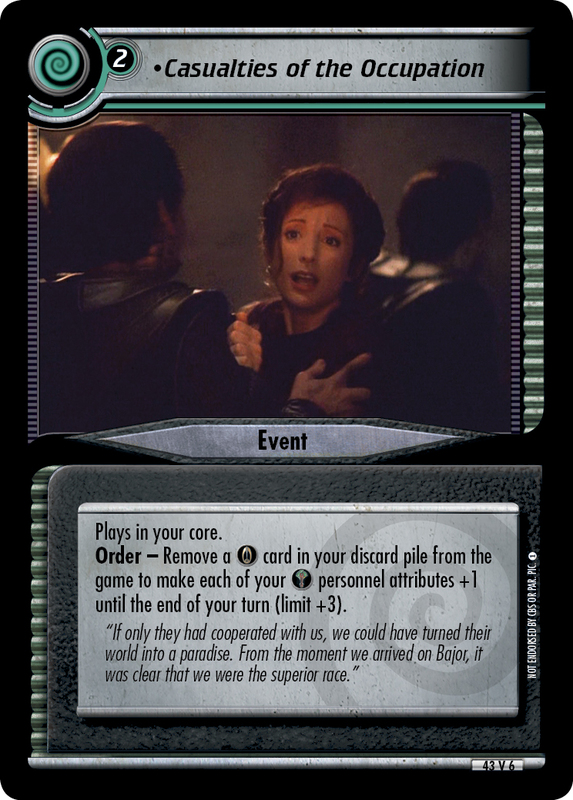 Casualties of the Occupation wasn't even meant for use in a single HQ deck (much like Interstellar Exigence in the dilemma pile), but now there's a deck where you can naturally play a bunch of Cardassian and Bajoran personnel. Sometimes, combinations crop up that are more powerful than were intended, and that's part of the fun of a deck-building game - as long as they don't stay at the top for long.